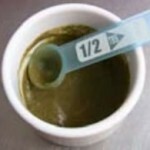 Oxbow Critical Care Fine Grind powder is mixed with 2-3 parts warm water. Test product through the desired nasogastric tube using appropriately-sized syringes (see below) prior to placement in the patient. Flush the tube with warm water, and determine the amount of flush required to thoroughly rinse the tube. Smaller gauge tubes require smaller syringes. Larger syringes used with smaller nasogastric tubes produce increased pressure leading to difficulty/failure of product delivery. Limit syringe size to 3 ml with a 5 French tube, larger nasogastric tubes usually accommodate 10 ml and larger syringes. Deliver product slowly, with steady pressure. Rapid administration produces increased pressure and difficulty with or failure of product delivery. Mix product as indicated. Use of Critical Care Fine Grind with smaller nasogastric tubes does not require additional product dilution if used with appropriately-sized syringes. Flush nasogastric tube with warm, clean water after every feeding. Use an adequate volume to ensure complete rinsing of the tube. Some patients benefit from sedation for this procedure. The authors recommend a combination of an opioid and a benzodiazepine (i.e. buprenorphine or butorphanol and midazolam) to reduce anxiety and stress. 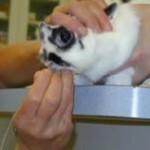 A local anesthetic (2% lidocaine gel or opthalmic drops) is placed into the rabbit’s nostril. Tube size is selected based on patient size; generally 5-8 Fr. argyle tubes are considered more pliable and resistant to degradation by stomach acid. Passage length of the tube is determined and marked by measuring from the tip of the nose to the last rib. The rabbit is carefully restrained to prevent patient injury, and the head flexed ventrally, which will aid passage of the tube into the esophagus instead of the trachea. A water-soluble lubricant or 2% lidocaine gel is applied to the tip of the tube and the tube gently introduced into the nostril, aiming ventrally and medially into the ventral meatus. A properly placed tube meets little resistance. The tube is advanced to the level of the stomach as indicated by the length previously marked on the tube. Verification of tube placement is determined by aspiration of stomach contents with a syringe. Placement of radiopaque nasogastric tubes can be confirmed radiographically. The tube is sutured to the medial aspect of the nostril and to the top of the head. Most rabbits do not require an Elizabethan collar, and tolerate the nasogastric tube well. Placement of a 5 Fr argyle nasogastric tube in a rabbit. 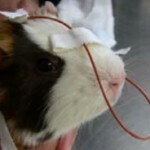 Placement of a 3.5 Fr nasogastric tube into a guinea pig. Tube placement in smaller patients is possible with care (see text). The nasogastric tube in place and sutured to the nare and the skin between the patient’s ears. 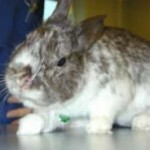 Rabbits generally tolerate nasogastric tubes very well. 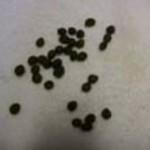 Feces of a test patient after three days of Fine Grind Critical Care administered via a nasogastric tube as the sole source of nutrition.